Were Trump Jr., Manafort, and Kushner Hoping to Get Clinton’s Emails From Putin? Before they met with a Russian lawyer, Trump’s campaign promoted a report suggesting the Kremlin had them. When Donald Trump Jr., Jared Kushner, and Paul Manafort were told in early June 2016 that the Putin regime had dirt on Hillary Clinton and wanted to share the material secretly with them to help Donald Trump win the White House, they quickly moved forward with a meeting with a Russian go-between. Trump Jr.’s email at the time—”I love it”—suggests that Trump’s top aides were keen to get their hands on any negative information the Russians had. But one possible reason for such eagerness might have been an online report that the Kremlin had somehow obtained Hillary Clinton’s personal emails. At least one top Trump campaign official had embraced this story and circulated it on social media—even though the report, which was highlighted on Fox News and disseminated by a conservative website founded by Laura Ingraham, lacked any sources and was first posted on a pair of bizarre conspiracy sites, including one associated with neo-Nazis. In the weeks before the meeting between the Russian emissary and the top Trump advisers, hope was burning brightly on the right that Russia somehow had obtained Clinton’s personal emails and would release material that would ruin her campaign. A senior Trump aide was publicly spreading this tale—and another suggested he believed it. But this story was just crap cooked up by a conspiracy site. An intriguing Security Council (SC) report circulating in the Kremlin today suggests that a “war of words” has broken out between the Director of the Federal Security Service (FSB) Alexander Bortnikov and Chairwoman of the Council of Federation Valentina Matviyenko over the issue of releasing to the Western media tens-of-thousands of top secret and classified emails obtained by the Foreign Intelligence Service (SVR) from the private, but unsecured, computer (email server) belonging to former US Secretary of State, and present American presidential candidate, Hillary Clinton. The reports said that Russian intelligence had broken into the computer of an infamous hacker who used the alias Guccifer. This prodigious Romanian hacker—his real name was Marcel Lazar Lehel—had been arrested in early 2014 and extradited to the United States. In May 2016, he pleaded guilty to two criminal charges and was later sentenced to 52 months in prison. In a May 4, 2016, interview with Fox News, Guccifer asserted he had penetrated Clinton’s server—but there was no evidence he had done so. (In 2013, he had hacked the email account of Sidney Blumenthal, a Clinton confidante.) These two sites claimed the Russians had stolen from Guccifer the Clinton emails that the hacker supposedly had swiped, and they provided supposed details of the ongoing debate within the Russian government on whether to pass the Clinton emails to media outlets that would reach the United States. Snopes.com, the conspiracy theory-busting site, has referred to WhatDoesItMean.com as a “notorious conspiracy-pushing outlet” and has debunked many of its claims, including posts noting that Clinton was seriously injured in a secret airplane crash and that a doctor who had leaked Clinton’s medical records was found dead. Despite the questionable provenance of the Russia-has-Clinton’s-emails story, this blockbuster revelation soon was being disseminated by right-wing media. It appears to have started with Fox News. Other right-wing outlets jumped on this assertion. 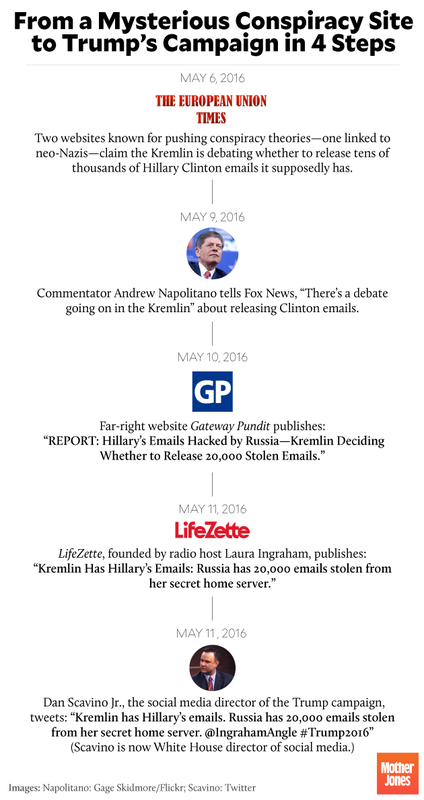 The next day, Gateway Pundit published a post headlined, “REPORT: Hillary’s Emails Hacked by Russia – Kremlin Deciding Whether to Release 20,000 Stolen Emails.” It cited WhatDoesItMean.com. On May 11, LifeZette, a site started by conservative radio host and Trump champion Laura Ingraham, posted a story with this headline: “Kremlin Has Hillary’s Emails: Russia has 20,000 emails stolen from her secret home server.” It asserted, “The Kremlin is considering whether or not to release some 20,000 hacked Clinton emails reportedly in its possession. Russian security services apparently obtained the emails as part of their investigation into the Romanian hacker Marcel Lehel Lazar, known as ‘Guccifer’—now in U.S. custody in relation to the Clinton email scandal.” It did not refer to any sources for this information. The post added that Napolitano had also said this on Fox. Two days later, on May 13, Frontpage Mag, a site started by longtime conservative provocateur David Horowitz, reported, “Thousands of e-mails from Hillary Clinton’s private, unsecured server, created while she served as Secretary of State, are reportedly in the possession of Russia’s Foreign Intelligence Service (SVR).” It linked to the European Union Times story. This fake news story was legitimized by the Trump campaign. On May 11, Dan Scavino Jr., the social media director of the Trump campaign, tweeted: “Kremlin has Hillary’s emails. Russia has 20,000 emails stolen from her secret home server.” He linked to the LifeZette article. And Trump continued to issue tweets slamming Clinton for her “missing” emails. There’s no public indication yet what Trump Jr., Kushner, and Manafort specifically hoped to receive from the Russians. But if they were aware of (and believed) these conspiracy-theory reports regarding the Russians and Clinton’s emails—real-life fake news that had been bolstered by right-wing media and Trump’s own social media guru—they probably would have been particularly excited to sit down with a Russian lawyer whom they were told was bearing derogatory material on Clinton. In any event, following this meeting, Trump continued to make Clinton’s emails a key campaign issue. Her personal emails, though, were never uncovered and used as ammo. This conspiracy theory was bunk. But there was actual skullduggery afoot. The Putin regime had managed to steal and exploit other emails to damage Clinton and help Trump. And as the Trump Jr. meeting now shows, Trump’s advisers played a key role in that plot. Even though the Trump campaign had been told the Kremlin wanted to assist Trump secretly, Trump and his aides constantly denied the Russian assault on the election was happening and provided cover for Putin’s covert operation. That was the real conspiracy.